Sometime, users may want to get data from Web Services provided by other party. It is a bit cumbersome to do at the moment, since Access 2007 and 2010 does not support importing data from Web Services. Users may need to write VSTO code and VBA code to call the web services. It will be very helpful if Access supports importing data from Web Services. Currently, Microsoft makes this decision based on what was the last copy of Access opened. This is a mistake. A .MDB should open in the version it was designed for. Note: A bootstapper application is needed (this is what the Visual Studio Team did). Running the Access 2003 runtime (for the first time and thereafter) as an Administrator is fine. Running the Access 2003 runtime as a Non-Administrator gives 3 error messages (only for the first time). Subsequent times are fine. This is a terrible first impression. Note: In Access 2007 this has been fixed (as it now uses Trusted Folders)… however the above bug with the runtime should be fixed. There should be a column in the Form designer that tells you the size of each object. When you have Access 2003 and 2007 you get a very long ‘Configuring’ message when you open them alternatively. This is not good, but I can live with it as a developer. It really impacts our customers, when we give them a runtime in 2003, and they use Access 2007. Those customers are getting this message all day long. When you have an Access 2003 Runtime installed (only) + using Office 2007, Windows Updates recommends (aka gives end users grief) patching Word 2003 etc (which they don’t even have). PS: Times like this I wish Access was not tied in with Office. Currently, it opens the last version of Access that was opened! This is not a solution. It gets worse when the user has Access 2007 installed + Access 2003 Runtime version. After using the runtime, double clicking on an .MDB makes it try to open a 2007 version in 2003. When you delete a reference it actually doesn’t release the reference. 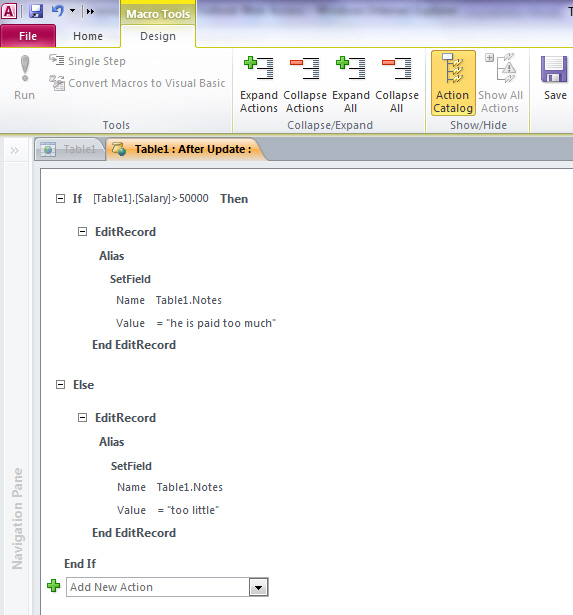 You can see the reference is still there when you loop through the references in VBA. The problem is Access crashes happen after this (this is not consistent and we are fairly sure this is the issue). When the user moves the location of the commandbar (aka Toolbar), the location is not saved when in runtime mode.